Blazing the headlines this week: Former Bosnian Serb leader Radovan Karadzic was arrested in Belgrade for committing war crimes during the Bosnian War in the 90s. These crimes include killing at least 7,500 Bosnian Muslim men and boys in Srebrenica during an ethnic cleansing campaign in 1995, shelling Sarajevo during a 43 month siege, and using 284 U.N. peace keepers as human shields -an impressive criminal resume. Karadzic will be facing the U.N. War Crimes Tribunal at the Hague. Rather than focusing on the Bosnian conflict and all the craziness in Yugoslavia (Slavoj Zizek gave a fantastically rambling lecture on the overall nature of the Yugoslavian conflict and NATO’s intervention that’s worth reading), I want to digress on the absurd circumstances of his capture and his characteristic intellectualism. Unlike Saddam Hussein, who was sucked out of a hole in the ground, Karadzic was arrested in Belgrade, living as Dragan Dabic, a bearded alternative medicine practitioner. Rather than be a fugitive, Karadzic simply assumed a new identity, playing the character of Dragan Dabic to its logical limits. Dragan Dabic successfully ran a private alternative medicine practice, living and moving about comfortably, without security, in Belgrade. 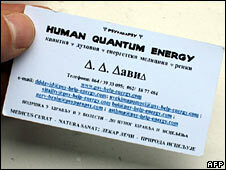 Dr. Dabic was a proponent of “Human Quantum Energy”. In fact, he emerged as a local leader in alternative medicine, giving lectures at alternative health symposiums, making appearances on TV Shows, publishing articles in magazines… He even maintained his own personal website, which offers special trinkets, including a necklace described thusly: “This necklace is for personal protection. It is worn on the chest at the height of the fourth chakra and thymus gland, the gland of youth and immune system. It harmonizes the energies of the aura and the physical body, protects from harmful rays … If you hold it in the palm of your hand for a few minutes it causes a turbulence of energy of the chakra, heats up, and vibrates even though it is not battery powered.”… The way in which a dictator that started a campaign to “terrorize and demoralize the Bosnian Muslim and Bosnian Croat population” that left over 200,000 dead and millions displaced managed to disappear completely into the image of a friendly, well-adjusted, holistic healer that “gave lectures comparing meditation and silent techniques practiced by Orthodox monks” reaches the limit of dark comedy. It is so disturbingly absurd that the only way I can respond is by laughing. It’s no surprise that Karadzic pulled off this kooky doctor cover; before being a murderous tyrant, Karadzic graduated from medical school and eventually became a psychiatrist. But the holistic healer guise is particularly absurd because it’s an embodiment of Karadzic’s aesthetic antithesis… Aesthetics? What Aesthetics!? Well… turns out that Karadzic is also a published poet. Is crushed by the silence and turned into a voice. In the smoke rumbles our consciousness. Empty suits slide down the town. Red is the stone that dies, built into a house. The Plague! Marches up the hill, within itself. and once you are human and then you are an air creature. What does the black metal in the garage have for us? Looking for the answer at his computer. There is a poem of mine about Sarajevo. The title was “Sarajevo,” and first line was “I can hear disaster walking. City is burning out like a tamyan in a church.” In this smoke, there is our conscious of that. And a squad of armed topola—armed trees. Everything I saw armed, everything I saw in terms of a fight, in terms of war, in terms of—in army terms. That was 20, 23 years ago, that I have written this poem, and many other poems have something of prediction, which frightens me sometimes [laughter]. If you are interested, the links to the poems feature several other poems. I’ve used my “favorite” of these in this entry… But what do these poems say about Karadzic’s aesthetic ideas? War is beautiful because it establishes man’s dominion over the subjugated machinery by means of gas masks, terrifying megaphones, flame throwers, and small tanks. War is beautiful because it initiates the dreamt-of metalization of the human body. War is beautiful because it enriches a flowering meadow with the fiery orchids of machine guns. War is beautiful because it combines the gunfire, the cannonades, the cease-fire, the scents, and the stench of putrefaction into a symphony. War is beautiful because it creates new architecture, like that of the big tanks, the geometrical formation flights, the smoke spirals from burning villages, and many others…Poets and artists of Futurism! …remember these principles of an aesthetics of war so that your struggle for a new literature and a new graphic art … may be illumined by them.